There was a Welcome Back, Kotter comic book. 'Strewth. It lasted ten issues. There was both a My Favorite Martian (nine issues) and a The Courtship of Eddie's Father (two issues) comic book. There have been tie-in comic books for The Terminator, Back to the Future, Lost in Space, Married...With Children, Quantum Leap, The X-Files and The A-Team. Star Trek and Star Wars have done very well as comic books. Star Trek: The Original Series started out at Gold Key Comics. When Star Trek: The Motion Picture came out, Marvel won the license and produced a number of issues before the license went to DC Comics. Right now, IDW is doing very well producing Star Trek comic books, based on the new J. J. Abrams reboot of the property. Star Trek made the bog leap to film in part because of the whole sci-fi boom of the '70's. A boom that was started by George Lucas and a film he made called Star Wars. Marvel produced a giant-sized, two issue adaptation of the film, a six- adaptation of the film and a total of over a hundred monthly issues that wrapped up with the release of Return of the Jedi. A few years later, Dark Horse acquired the license and has had great success for over twenty years with the property. Star Wars-inspired titles like Buck Rogers in the 25th Century and Flash Gordon - which had been newspaper strips - to make the jump to film and television and ultimately comic books. Battlestar Galactica did modest success for Marvel in the '70's and recently for Dynamite Entertainment. Right now there is a boom in licensed comic books. Cult favorite Firefly is returning as a Dark Horse comic book, where Buffy the Vampire Slayer has done well with both Season Eight and Season Nine comic books. Firefly has already enjoyed success with mini-series and one shot books at Dark Horse. This year, Doctor Who celebrated his 50th anniversary on BBC and in a twelve-issue series, "Prisoners of Time", at IDW. The Matt Smith iteration is wrapping up a four-year run as well there. The Green Hornet was at Now Comics, then at Moonstone and now does very well at Dynamite Entertainment. The Lone Ranger is at Dynamite; along with The Bionic Man and The Bionic Woman. Along with Firefly at Dark Horse, coming in 2014 at Dynamite is The Six Million Dollar Man: Season Six. Companies like Boom!, Dynamite, Gold Key, IDW, Innovation, Now, Topps as well as Dark Horse, DC and Marvel have had modest to overwhelming success with licensed comics. DC and Marvel have turned it almost into an infinity loop. Comics based on cartoons or live action series based on their comic book characters. Batman, Superman, Green Arrow, Green Lantern, Justice League, Teen Titans and Young Justice for DC; Spider-Man, The Hulk, Iron Man, Fantastic Four and The Avengers are just a few of the characters at Marvel that have been developed as cartoons, then in turn tie-in comic books. This is basically just a long explanation that if you can watch it on television or in film, you can probably see it show up as a comic book. Which makes me hope that with Warner Bros. going ahead with a reboot film of Gilligan's Island, DC Comics will add the property as a digital-to-physical comic book. Bongo Comics has produced The Simpsons, Bartman, Radioactive Man and Itchy and Scratchy comics along with Futurama comics. The idea is not that far-fetched. I think it would be kinda cool to see continuing adventures on Gilligan's Island. Classic Gilligan's Island. With the original characters. Like what DC is doing with their digital-to-physical Batman '66 comic. They can use the designs from the animated series and run with it. I'm nostalgic, so I would buy it in a heartbeat. The question is, would a '60's concept like Gilligan's Island sell today. IDW launched with CSI and 24 tie-in comics. Dynamite is working both The Lone Ranger and The Green Hornet which are Golden Age concepts, as well as '70's properties The Bionic Man and The Bionic Woman. I would think if the stories and the art are good, a Gilligan's Island comic book would sell. There have been a lot of television and film tie-in comic books. The ones that sell have had high quality production values. I believe that Warner Bros. and DC Comics need this. They have been trying to launch their super-hero properties from comic books to live action for a while now. Wonder Woman stalled in a live action reboot; Green Lantern underperformed. Superman has had mixed results. Batman has been the only proven money-maker. I might be biased, because I am a fan of Gilligan's Island, but I'd like to see the little Minnow that could finally achieve the potential that it has been so close to. Labels: DC Comics, Gilligan's Island, Gold Key, Marvel, Star Trek, Star Wars, Warner Bros. I don't know... maybe in an Archie/Jughead type comic book.. but since there's no super-hero, no flying space craft, and no time travel, they might have a difficult time finding an audience. 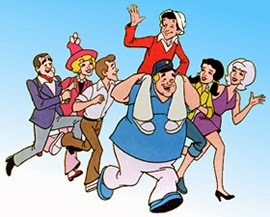 Although, in fairness, I LOVED Archie Comics, and would most likely read Gilligan's Island Comics. PS. I had no idea so many of my favorite movies/TV shows were originally, or became, comic books. I need to hang out at comic book stores more often! I'm definitely thinking this would make a great all-ages book. DC has done very well with Looney Tunes and Scooby Doo. Not too long ago, they had Tiny Titans, Superman Family and Li'l Gotham. This is on top of the tie-in books they've had for their various super hero cartoon series over the years. I had no idea that there was a My Favorite Martian or The Courtship of Eddie's Father comic books. The best resource for comic books I've found - other than a comic book store - is the Great Comic Book Database and Comic Vine!